Spread some holiday cheer around your classroom or in your school's hallway with these wild sweater designs! Kiddos will love to decorate these sweaters and add on their own pictures! And BONUS: This is a grammar lesson too! Kiddos will use adjectives to describe their sweater. Grab a pic of your kiddos or have them select a picture from a magazine! It's a grammar lesson too! Click here to grab this FREE download now! As always, we like to integrate seasonal themes into our curriculum to make the best use of our instructional time. We've got some great holiday themed How To writing templates! Best of all...these activities also have a hands on task! How to Make Hot Chocolate! Let your kiddos make their own hot chocolate and sip on a warm drink while they write! We make warm water in our classrooms using a crock pot. Kiddos add in hot chocolate powder and marshmallows. Then they write about the steps to make their hot chocolate! 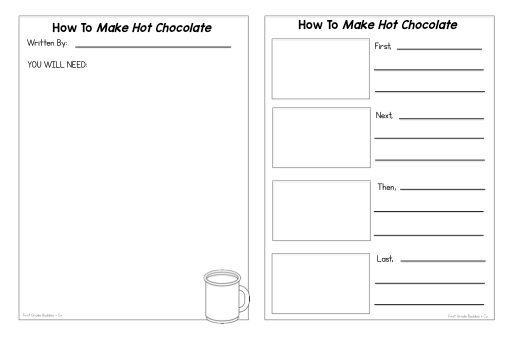 These FREE templates have an additional planning sheet for student to list the materials needed for their how to topic! How to Wrap a Present! Guys, this is the MOST fun activity to watch!! 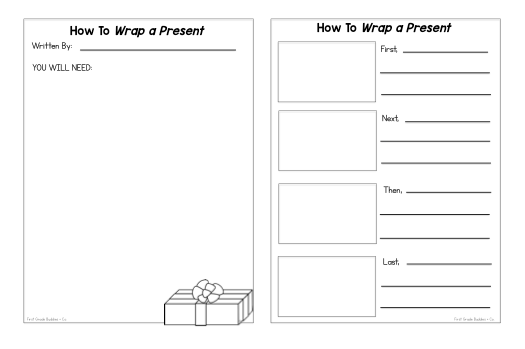 Let your kiddos wrap their own gift! Now, we do model the process first, having the whole class tell us the directions as we wrap. Then, we send kiddos off with a small box (crayon boxes and jello boxes are idea size), a pre-cut square of wrapping paper, and a gift bow. We set tape dispensers at each table and let kiddos get to work! 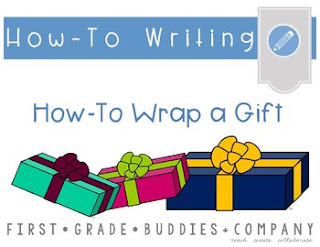 Then they write about the steps to wrap their gift! 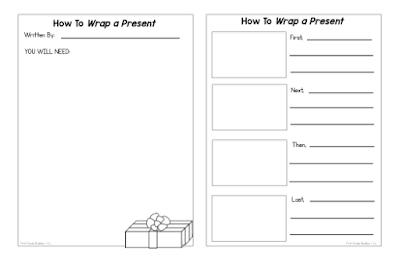 We've hung these writing templates in the hallway with the gift boxes attached! You can also grab the version show in the picture above! Secret Pal is a fun way to share kindness and gift giving in the classroom among your kiddos! The kiddos LOVE every step of this week long secret gifting activity! Secret Pal takes some organization and work time from kiddos, but the pay off from seeing kiddos excited about their gift each day is worth it! First, you'll need to gather a few supplies! You'll need some wrapping paper and items to make the gifts..
First, kiddos select a name of a classmate. Then they write clues about themselves using this FREE template. We usually guide the kiddos as to what type of clue to write for each number. This helps get all kiddos to complete the task in a timely manner and stay on track...without giving away too much about themselves! Next, kiddos will make bracelets and booklets. Then they'll wrap each gift and attach a clue. We have all kiddos get the same gift each day. Here's what each day will look like! To grab the clue template and written directions, download this FREE file! This mini book is a sweet activities for kiddos to complete and take home to their families over the holiday! It also pulls in a bit of review on option writing as kiddos provide a reason for their gift choice. Grab the FREE Gift Giver mini book! These markers really last a long time in our classrooms! They keep a great tip for writing and have vibrant colors! ALL DAY after they receive them! Here's a 30 pack of clipboards for $29 (Amazon affiliate link). So if you don't want to spend over $1 each, try to pair up with other teachers and split a box to get the exact amount for your class! 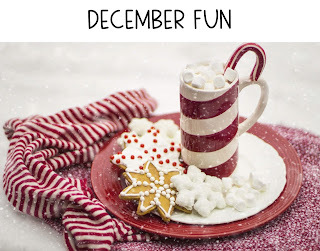 Here are our best holiday themed resources from our TpT store! Click each pic to find them!